Roz Cran and Judith Alder are co-organisers for Blue Monkey Professional Development. 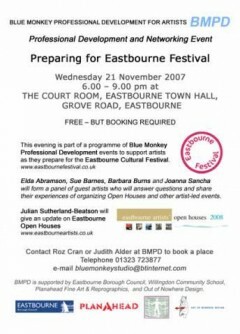 A successful Networking Evening at the Blue Monkey Studio in Autumn 2006 demonstrated the interest of local artists in such events. We have consulted, discussed and are starting to plan a programme to fit the needs and interests of artists in the area. This new site is at a basic stage but we plan to develop it and post useful information for artists on it as well as link to other helpful sites. Another meeting today to review progress on the planning of our next Event on 21 November. We went to visit the Court Room and check out the facilities. Water and coffee machines are available. We can mark on an outline plan how we would like the room laid out for the evening. We continued discussions at the studio, updated each other on our progress and put in dates for future meetings. Next we made broad outline plans for the year ahead and made timings for putting in funding applications. We hope to have at least one page of our new website up and running in time for this next event. We have been working on paper and email flyers, checking info, and AIR insurance for our next event. We have invited a panel of guest artists (Elda Abramson, Sue Barnes, Barbara Burns, Joanna Sancha) to share their experience of organizing Open Houses and other artist-led events. This will be followed by networking time for artists to mingle with a drink and talk to each other informally. Please bring any promotional material to share. Julian Sutherland-Beatson, organiser of Eastbourne Open Houses, will be giving an update on Open Houses news at our event at Eastbourne Town Hall on Wednesday 21st November. A panel of experienced artists will lead discussions at the event. So far Joanna Sancha, Sue Barnes, Barbara Burns and Elda Abramson, who are all experienced at organising artist-led activities, events and Open Houses, have agreed to be panelists. They will each talk for 5 – 10 minutes about their experience of organising events and will then respond to questions and issues raised by the audience. NEXT BMPD EVENT Plans are underway for the next BMPD event. 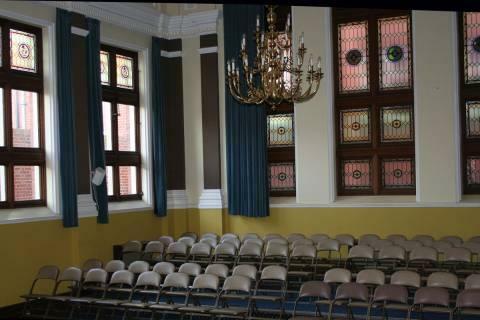 We have negotiated the date: 21 November, and the Court Room is booked at Eastbourne Town Hall. The evening will focus on preparations for the Open Houses events during the first Eastbourne Festival next March. We will invite a number of artists who have run or participated in Open Houses in other towns. We hope artists will gain valuable information about planning and organising. We have a number of meetings set up ourselves in order to run this event in the best way we can. Judith Alder and Roz Cran are two artists based in East Sussex. They are currently working together on two projects: BMPD is a programme of professional development and networking events for artists in the Eastbourne area; Breaking Ground is a collaborative project which has been supported by a NAN New Collaborations Bursary and an ACE Grant for the Arts. Breaking Ground is being charted on a-n Projects Unedited.